Earlier this week I posted the reveal of our butler’s pantry renovation, a post that detailed the transformation from storage closet to beautiful serving space. You can read about that renovation HERE. 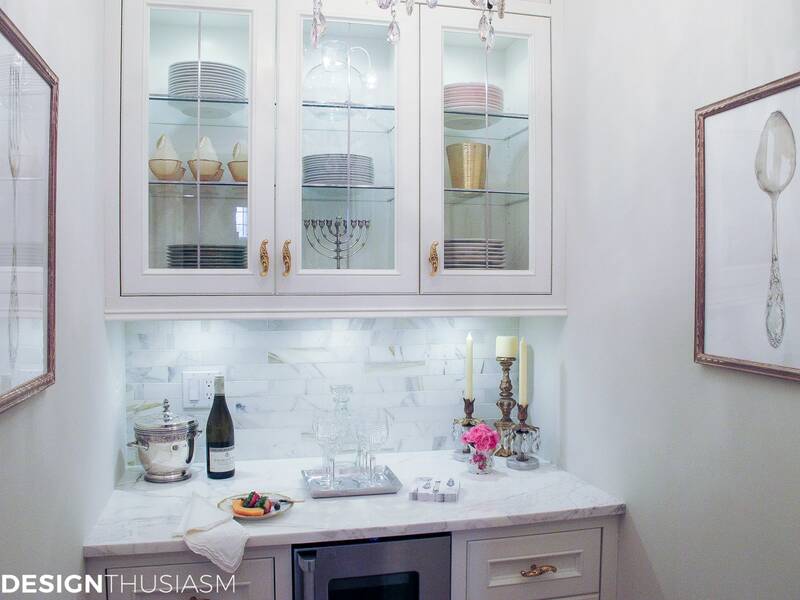 I promised to come back and share with you the finished product, fully decorated, so I’ve compiled for you 10 gorgeous elements to add French style to the butler’s pantry. 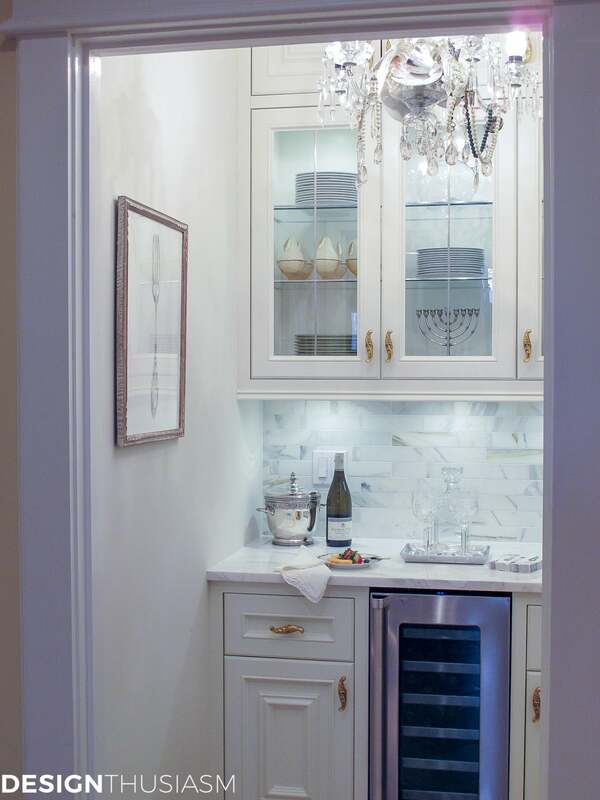 As with most of the design in my home, I approached the butler’s pantry with my signature enthusiasm for French Country style, utilizing many of the elements I so often prefer. Most of my vignettes include a balance of contrasts, from polished to patina, sleek to pastoral, light to colorful and hard-edged to softly draped. The list below comprises some of my favorites. 2. Crystal wine goblets – one of the key elements used liberally in my home, crystal affords the opportunity to bounce light in a space. The glints are particularly lovely off the cut crystal pattern in these goblets. I’ve also tucked a decanter behind the stemware on the tray. 3. 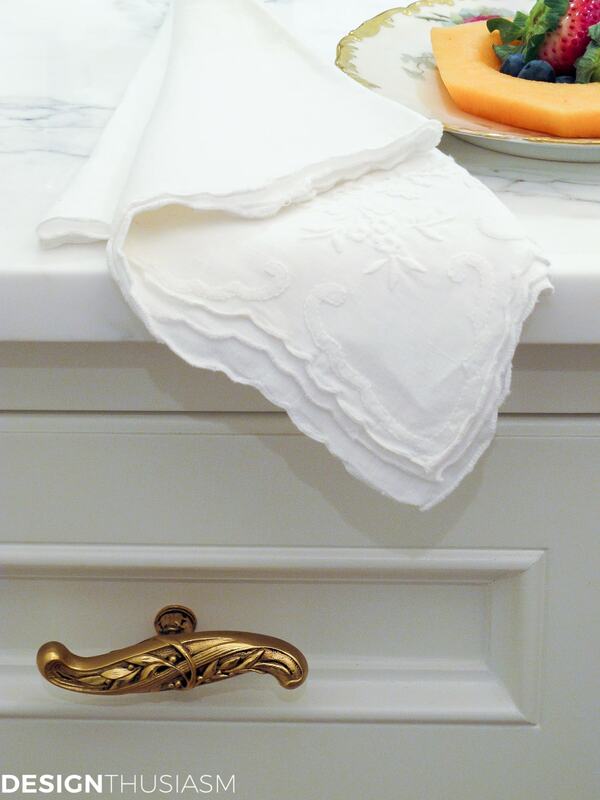 Embroidered white linen – another go-to element present in most of my rooms, white embroidered linen lends a softness and purity to the arrangement. Here I used a napkin, but often it’s a tea towel, a pillow or even a coaster. 4. 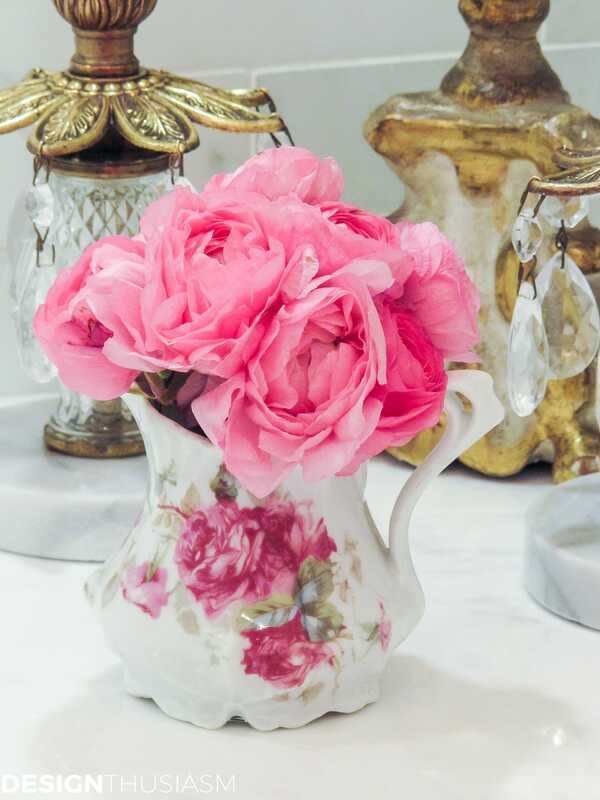 Vintage floral china and fresh flowers – florals are a great way to add touches of color and here I’ve incorporated both fresh ranunculus and a vintage patterned creamer. Pieces from my china collection pop up all over my home. 5. Kitchen utensil prints – the elements I’ve used here were selected not only for their look, but also for concept, taking into account the purpose of this space. 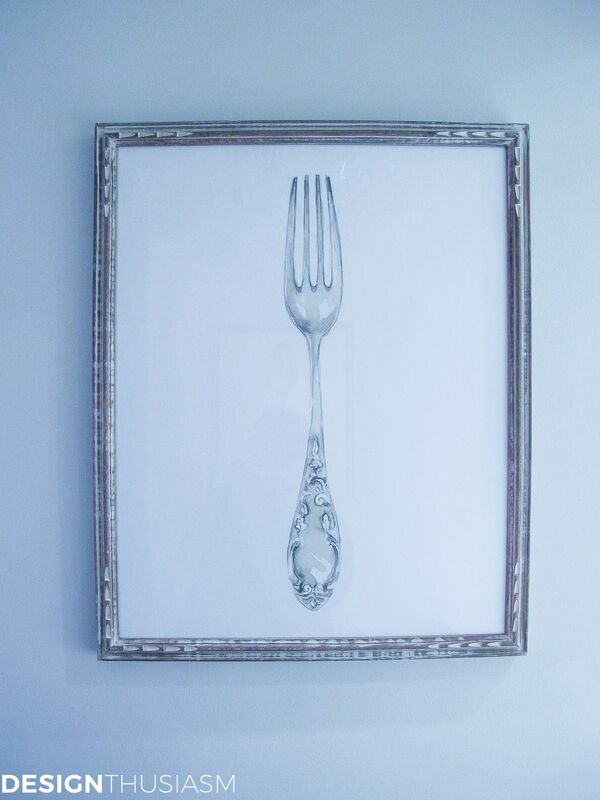 In that spirit, I loved the idea of using artwork depicting pretty flatware pieces. The fine art prints are from Minted.com. If like me, you didn’t realize Minted has an entire Minted Art section, you should definitely check out their website to take a look. The one above is entitled Let’s Eat – Fork and, you guessed it, the one below is Let’s Eat – Spoon. I selected the matching pair which would also look fabulous in a kitchen or breakfast nook. I was provided with the artwork from Minted for this post, but I was delighted to see they had so many wonderful things to choose from. The prints can be ordered framed or unframed, with varied options for framing choices. 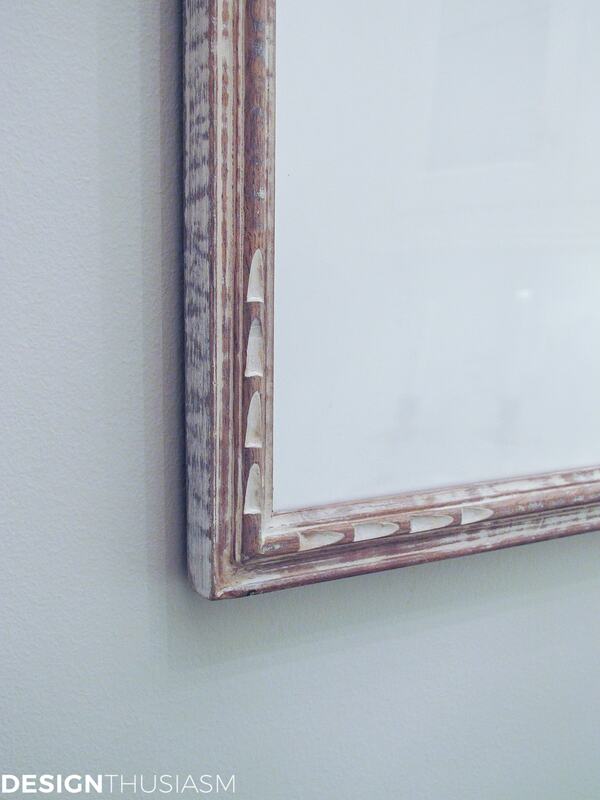 I was thrilled with the quality of the framing, making them super easy to hang. 6. Pretty cocktail napkins – a wonderful surprise was finding these lovely little napkins in a local store, which worked perfectly with my art prints. 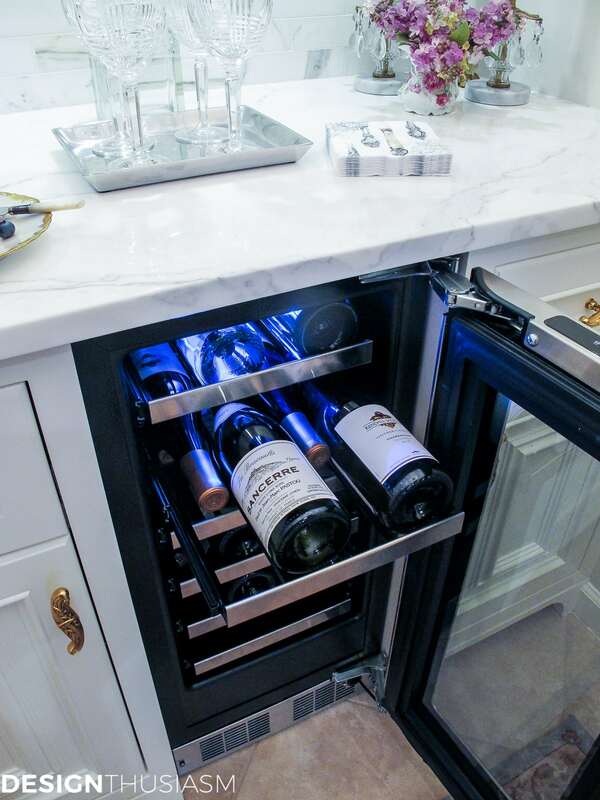 Thematically, they also belong in the butler’s pantry, a space made for serving drinks. 7. 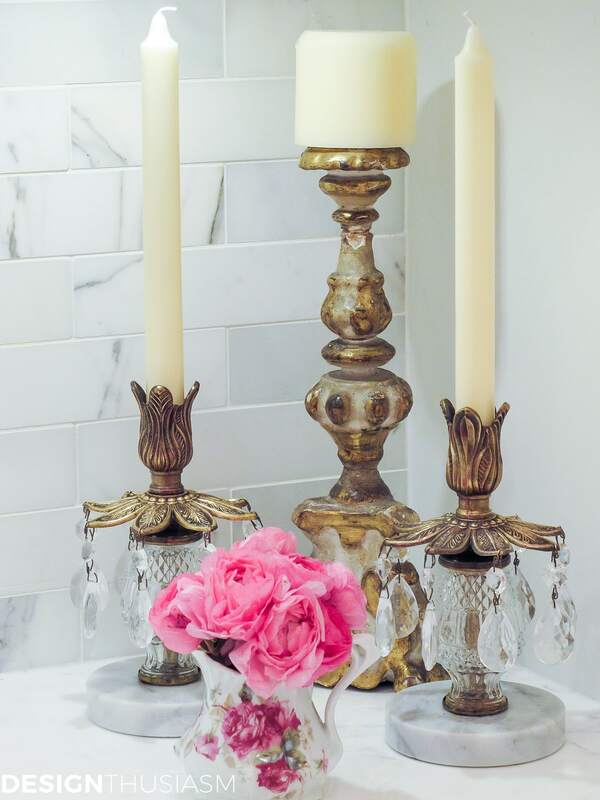 Vintage brass candlesticks – I’ve always been comfortable mixing metals and you will very often see me use gold and silver together. Here the gilded look is attained with vintage brass candlesticks and pear shaped crystal drops. 8. Antique chippy candlestick – I probably should have named my blog ‘bling and patina’ and right on cue, next to the blingy pair of candle holders is my chippy paint church candlestick. The notion of contrasts helps underscore the effect of one element when balanced against another. I haven’t even listed the items behind the glass cabinet doors, but I’ve made sure to use more of the same within for a cohesive presentation. 9. French wine – and what would a French pantry be like without French wine? 10. 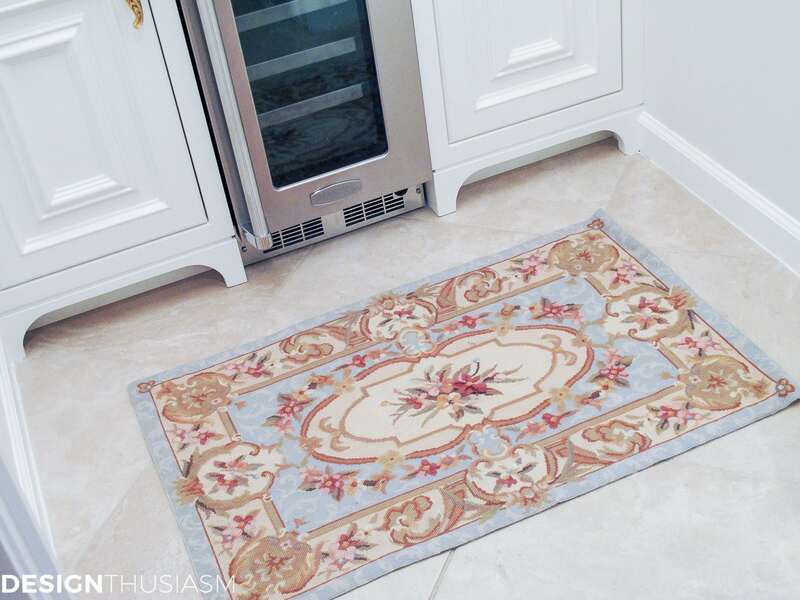 Needlepoint rug – the finishing touch is a needlepoint rug in an aubusson type pattern. Perfectly sized for the space and playing off the floral china, it adds just the right punctuation for this tiny space. Of course I don’t keep fresh fruit out at all times, but I do have faux pears that hold the spot when I’m not actually serving. What are some other items you’d keep in the butler’s pantry? Please leave me ideas in the comments below. Stunning room, everything flows so well. You will have so much fun decorating. Hats Off to your contractor and you as the decorator. I am new to your site. Beautiful photos. I am lucky enough to live in Burgundy france renovating an old farmhouse, we are 35 kms from Sancerre. So I do not have to go far to pick up my french wine. Thanks so much and welcome! And how lucky for you… 🙂 I am definitely a French burgundy girl – love the Montrachets!! Thanks for stopping by! A Butler’s Pantry has long been a dream of mine too. You have the perfect space for it and it turned out so sophisticated as well functional and beautiful. You certainly have a knack for celebrating the beauty found in anything you put your hand to. I wanted to mention that some of your photos are coming in blurry of late. I’m having trouble like this on some other blogs as well. They are clear in the email and in windows on my PC but not after opened in Safari on iPad. Someone said it had to do with WordPress. Thought you’d want to know. First, thanks so much for the lovely comment, Pamela! What a nice thing to say… 🙂 Re the photos, I’m not sure what’s going on with that but thanks for alerting me to it. For me, they’re really clear on my iPad, but not so much on my laptop in Safari. Will have to research this. The photos are so much clearer when I post to Instagram because I post full size there. But then there’s the delay of transferring them to mobile to post, so it takes me a few days to get to it… lol. Anyway, I will look into it and again, thanks so much for the kind words!! Seeing this brings back memories of my grandmother’s house. It was filled with wonderful dishes, silver prices and her best crystal. We had tea parties and I got to pick my favorite China. I love your updated version and the color is awesome! Thanks, Ellie!! Yes, I’m definitely a tea party girl. So funny because my fashion sense is the opposite… lol. Thanks, as always, for visiting! Looks beautiful all put together. Thanks, Rose and thanks for stopping by! Mine needs updating. Thank you for showing these pics. Beautiful! My pleasure and thank you for visiting and taking the time to leave a comment! backsplash/counter. The cabinet hardware adds warmth and style. This is a very inviting space you have created. So Beautiful. I love everything about this makeover, from the whimsical chandelier down to the rug. 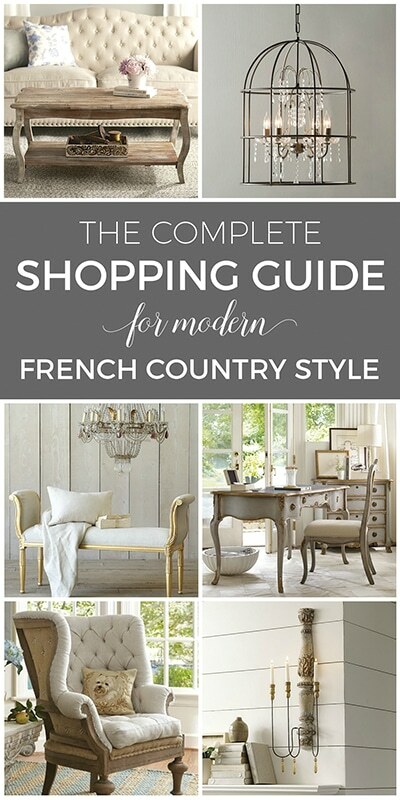 You make French Country design seem so effortless, when in fact, it takes a lot of thought, planning and editing to make a room come together with such elegance. I love the way you use mixed metals with such balance, nothing outshines anything else they just all seem to blend together in perfect harmony. As always, Well done. Aw, what a nice comment, Kimberly! Thanks so much… 🙂 I just put in everything I love, but it is a kind of formula I follow always having these same elements in most of my rooms. Thanks for stopping by! I agree completely! I want that room. It is gorgeous besides being useful. Couldn’t ask for anything better. Excellent job. This is such a gorgeous makeover. What a creative way to use and otherwise oddly placed closet. Now it’s purpose makes perfect sense with the flow of traffic through the hall into the dining room AND it’s just plain beautiful to look it. Lory, I love that you use mixed metals…me, too. 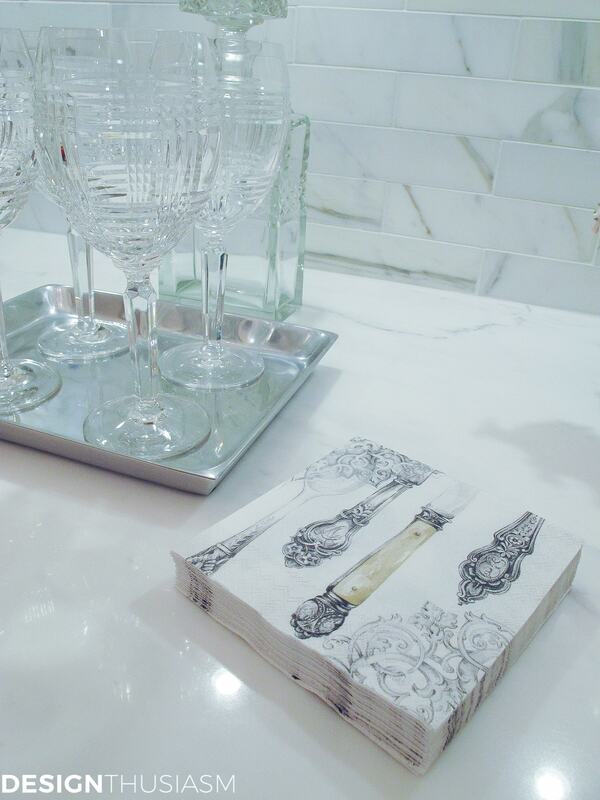 You always know just what will work, from the artwork down to those perfect napkins. I feel I am in some wonderful dream where there is this great house that just gets better and better every time I fall back to sleep…loving it all! So wish you lived closer….I sooo need a professional designer to figure out fabrics and paint colors with this open house plan….a designer whereby I love their ideas. I’m having such difficulty finding the kind of fabrics I want, with a good deal of them being too contemporary for our furniture, or the ones I like cost WAY too much. Think I’ll just go to sleep and dream about YOUR house…lol! I just love Bobbi Duncan’s comment about not knowing what to do with my own house so just dreaming about how lovely yours is! That is what I do every time I look at FB sites and see all the wonderful Country French ideas. 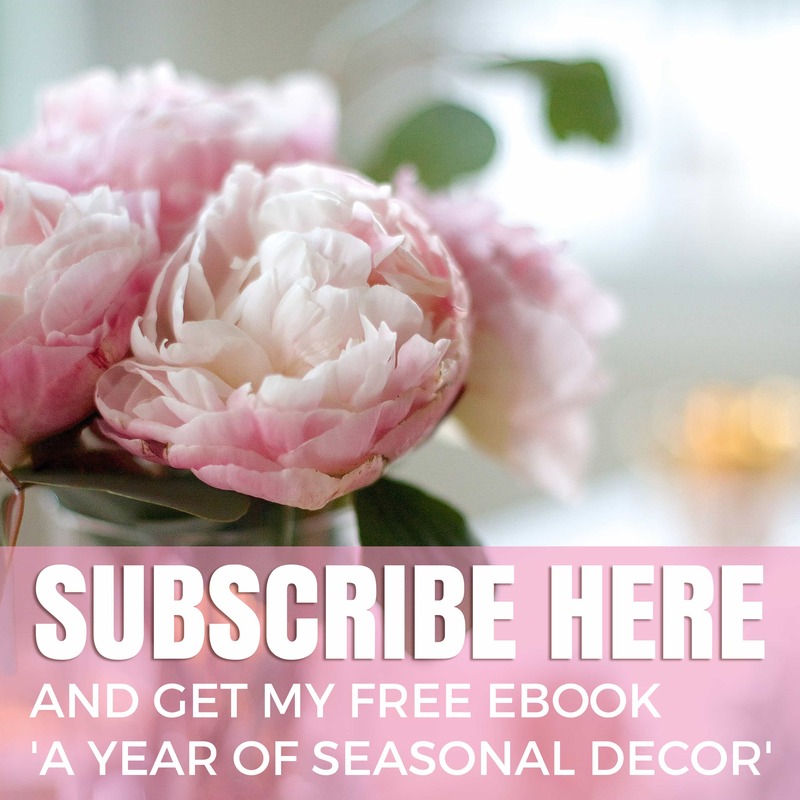 I appreciate so much how you go into detail about the way you decorate, whether it is a room or tablescape. This helps those of us who are “challenged” in that area to understand why it looks good and how to achieve that “look.” Love your little details! Oh how beautifully styled! If I was you I would sit and stare at it all day! You should be very proud of what you’ve accomplished in this space! Well done indeed! Thank you so much for sharing this inspiring project at Making Broken Beautiful, it is a pleasure to have you and I hope you will join in again soon! Thanks, Terry! And, lol… I sometimes do just turn the lights on and stare at it… 😉 Thanks for hosting!! Where to start!!! 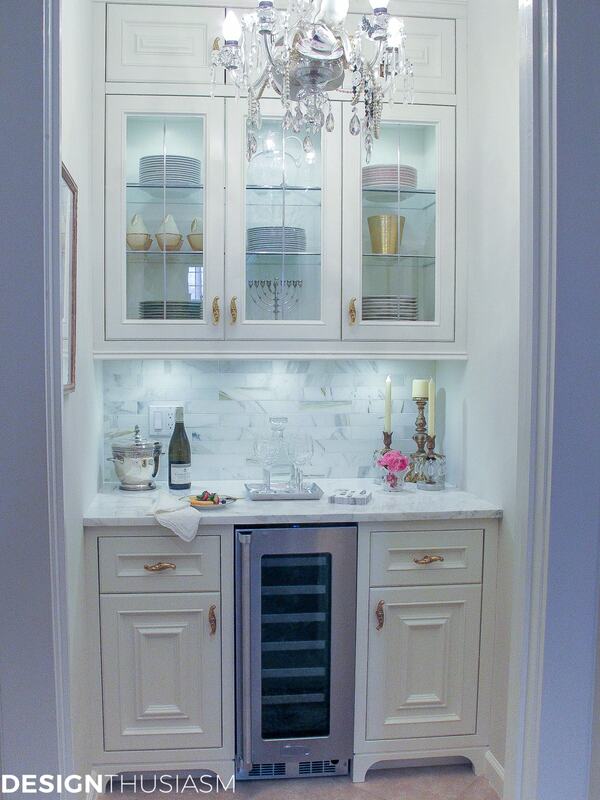 Stunning, beautiful, elegant etc… Congratulations for your Butler’s pantry, what a marvelous result!!! Love all your posts as they are very informative, instructive and very inspiring!! Like following a design course :-)) I am learning a lot and your in-depth descriptions are very useful when visiting shops!!! Have a great weekend!! Thank you, Kate! That’s so nice to know that my posts are resonating with you… 🙂 I tend to focus on the visual, but I’m really glad to hear the text is inspiring, as well. Thanks for taking the time to comment and of course for visiting the blog! Thanks so much! So glad you appreciated it… 🙂 And thanks for pinning too!! It’s gorgeous! You have a great constructor too. We had a butler’s pantry in my old big farm house. Now we don’t and looking at this made me want one and brought memories to me. Aw, thanks Fabby!! Yes, I was lucky with our contractor… 🙂 Thanks for visiting! 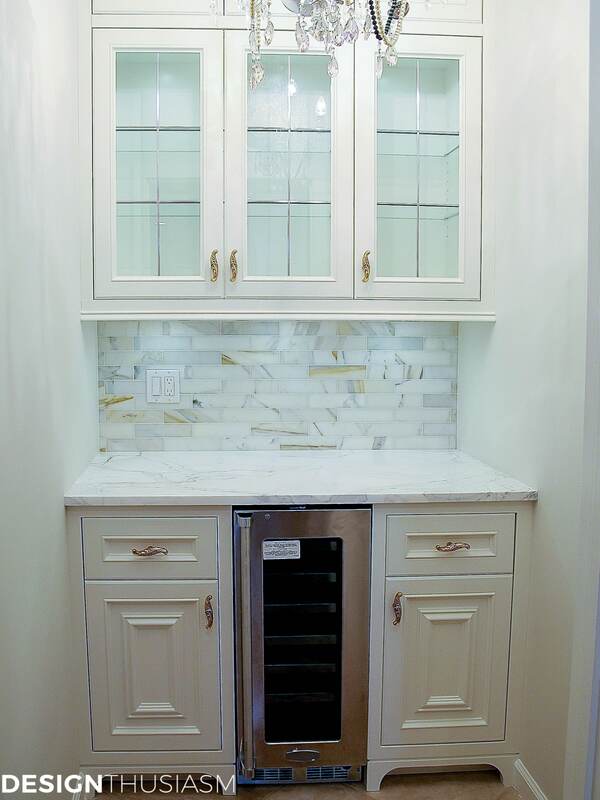 Since you have a wine cooler and have stated you are using this space for pouring drinks, I’m surprised you don’t have any wine (or any other drink ware) in the upper cabinets. 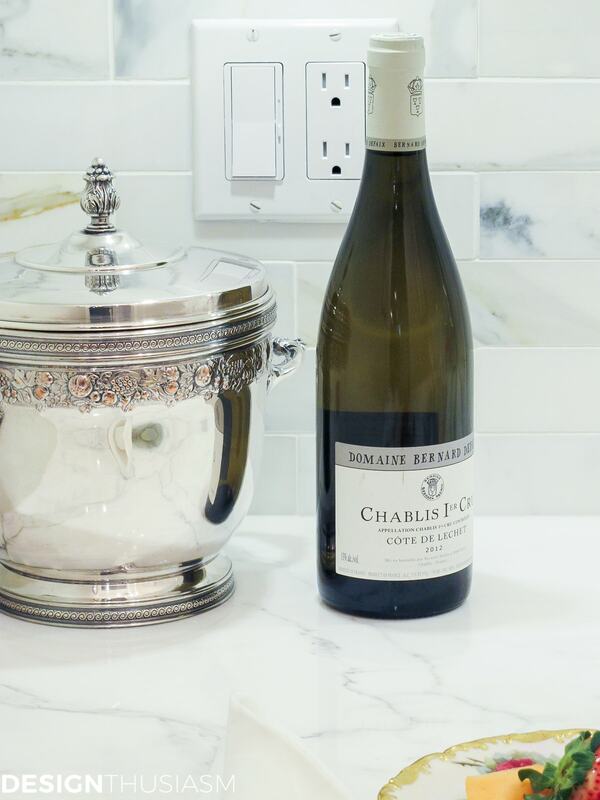 Ha ha, interesting observation… 😉 We drink mostly white wine, so it’s all in the wine captain, but there is one bottle on the counter next to the ice bucket and the wine goblets are front and center on the counter. Given my penchant for setting tables, the real need was storage for my many sets of dishes. Thanks for dropping by! Is it possible to see a close up of the chandelier? Absolutely beautiful Lory. Everything is gorgeous. You did a fabulous job. what a wonderful space. your attention to detail is awesome. i collect beautiful trays and they would do nicely inside your cabinets. everything from pewter to intricate silver plate with detailed handles and feet to very old tole painted oval trays. Oooooh… what a great idea! Love the idea of leaning trays behind my things. I’ve actually done that in the dining room, but it would look great in here. 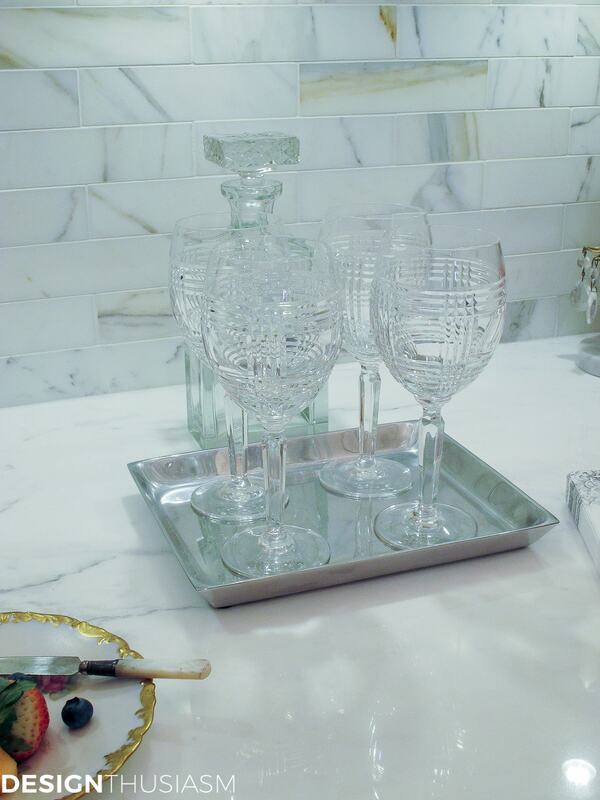 At one point we considered using antique mirror as the backsplash, but I love the marble tile. Better to put patina trays in the cabinets… 🙂 Thanks for visiting and for the kind words, as well as the great idea!! Very tastefuly done. The backsplash and the chandelier do it for me. 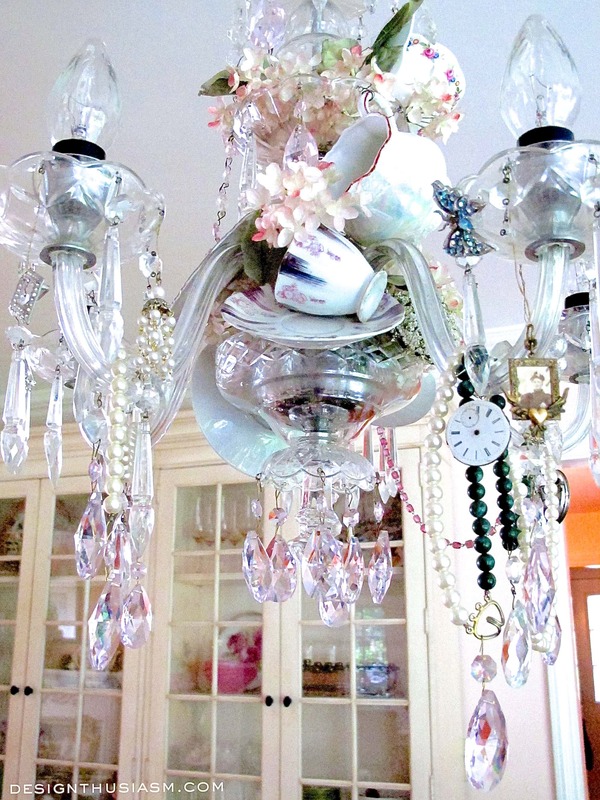 Most folks probably would not have even considered a chandelier in a butler’s pantry. Kudos to you for thinking outside the box. All the materials, i.e, glass doors, light colored marble, backsplash and cabinetry make the space seem so much larger. Again, the chandelier is the icing on the cake! The visual impact adds a very stated elegance. Thank you so much!! I think I was just so driven on this one that I didn’t let anything hold me back… 😉 I knew what I wanted and just tried to ensure the space would cooperate… lol. The chandelier had been in my old dining room but I felt it was too small for this one, so it seemed meant to be that it would go in the pantry. So glad you appreciated all the details. Thanks for visiting! Awesome job… Love the post. X deux ? Absolutely gorgeous! When I saw the vintage creamer, I did a double take and headed straight to my China Cabinet, where I have a very similar creamer! Style and shape is very similar, mine is painted in roses also, but different color roses with a leafy background. I will definitely start following you. Thanks, Lynette! And how funny about the creamer. I actually have another one that’s quite similar, too… 🙂 Thanks for visiting and following!! I tbi,k,i recognize the blingy candlesticks from a Christmas holiday post. They might of been elevated on something. Thanks you and yes, you are correct!! The candlesticks were used in my ‘tartan and roses’ Christmas tablescape here: https://designthusiasm.com/tartan-roses-christmas-dinner/ They were lifted on upturned vases… 🙂 Thanks for visiting! Hi, Lory. I saw this at Hometalk and rushed over here to subscribe to your blog. Every element of your pantry is just beautiful. 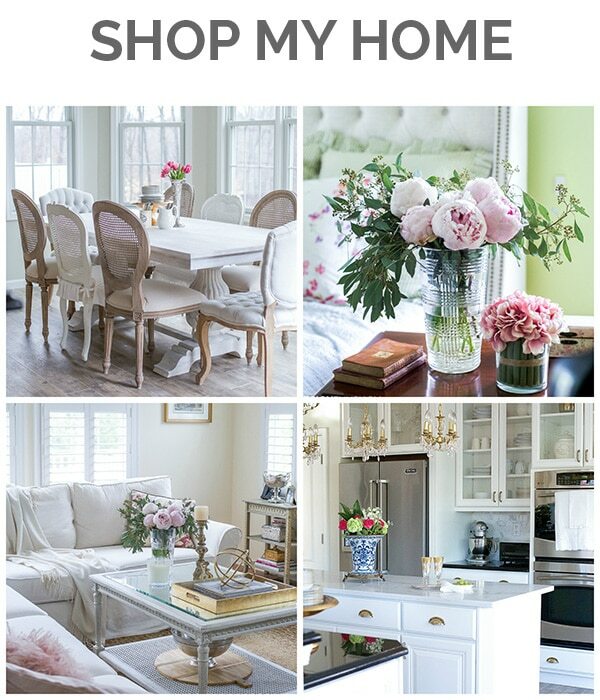 It’s exactly how I want my entire home to look, haha! It really shows that you put such attention into every little detail. A labor of love with a spectacular result. There is nothing I don’t love about it but the hardware is especially gorgeous. They are the jewelry on those lovely cabinets. Well done! Fabulous Post! 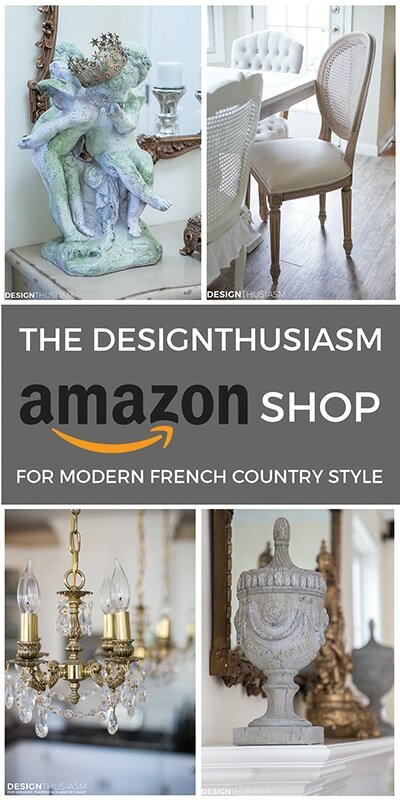 I love this french influence in your decor! 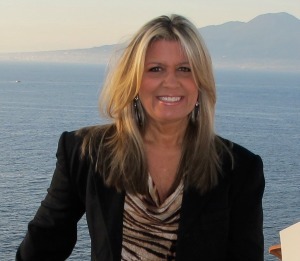 Great blog, I see you like to travel like me! Have you been to Italy.. I go every year.. You must love France! Thats on my bucket list. Thanks so much, Maria! And YES, I love to travel… 🙂 I love both Italy and France. You can check out some of my travel posts here: https://designthusiasm.com/travelfolio/ They’re almost all France or Italy… Lol! I love it!! 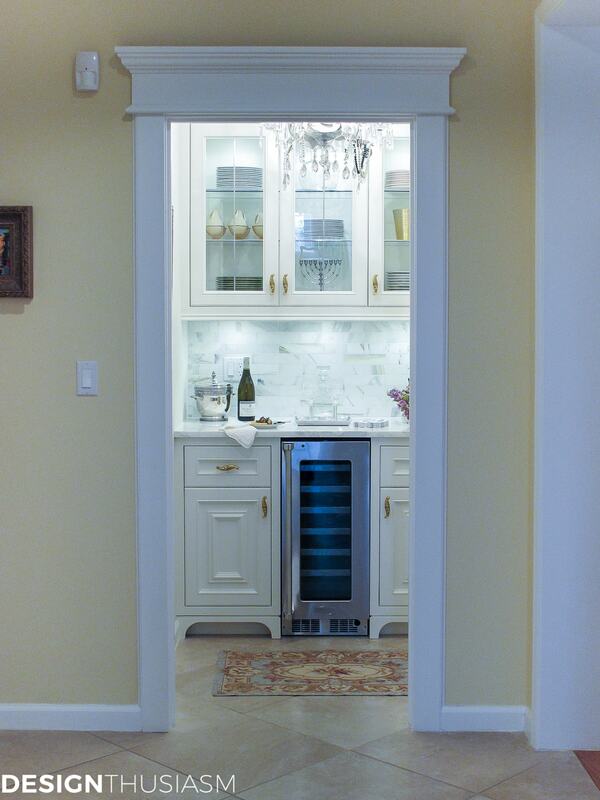 Your style is just beautiful, and this little butler pantry sure makes a big impact. 🙂 Can I ask you where you got that gorgeous rug and where you buy those embroidered linens? I can never find good prices for them. Thank you, Mariele! The embroidered linens I always get from antique sources, sometimes online, sometimes actual markets, whether nearby or when I travel. They’re usually not terribly expensive at all. I’m not sure where the rug is from – probably online, but I can’t remember. I have a similar one I got from Horchow, but this may have been from ebay. It says on the back Victoriana Originals. Since it’s just the size of a mat, it wasn’t super expensive. Thanks for visiting! This is gorgeous Lory. What a beautiful area you have created in your stunning home. You have an amazing eye for detail. I love the understated elegance and all the decorative touches. Thank you so much, Janet!! This was definitely my pet project of the year. Oh such a delight. I love this. If is were mine I would walk past many times a day and find every excuse to use it. Thank you for sharing and putting a pin in yet another dream. ? Thanks, Wendy!! This little space is a constant reminder to me that we change anything that’s not working for us, given enough time and ingenuity. Thanks! And I agree about butler’s pantries in general… 🙂 Always wanted one. Thanks for visiting! 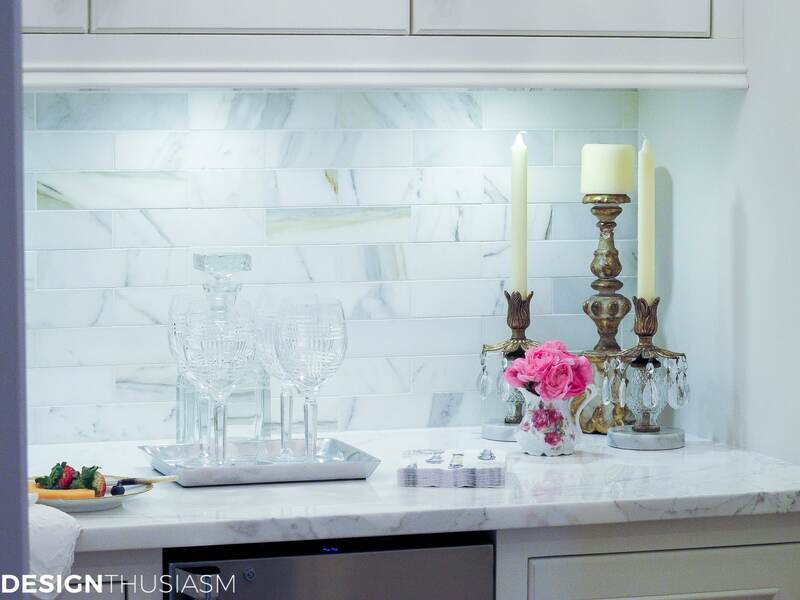 My favorites are the choice of varicolored marble backsplash (it would have been so ‘easy’ to continue with the plainer white kind) and the 9-branch candle holder front-and-center in the glass cabinet. Both of these seem quite personal, giving an unanticipated ‘edge’ to your vision— something one wouldn’t find in just any butler’s pantry or French-inspired space. Yet here they really ‘nail’ it. I love your design! I’m building right now and have a similar size butlers pantry. Can I ask what brand of wine cooler you decided on? It is the same size we need, but they are hard to find sometimes. Lory, it’s beautiful and not too huge like some butler’s pantries I’ve seen (some as large as a normal size kitchen!). I, too, don’t have any qualms about mixing metals. Sometimes, I get so caught up in your blog looking at your beautiful work, and following your links that I forget to go back and leave you a comment. I just clicked on this post again, and realized I didn’t leave you a comment on this one! 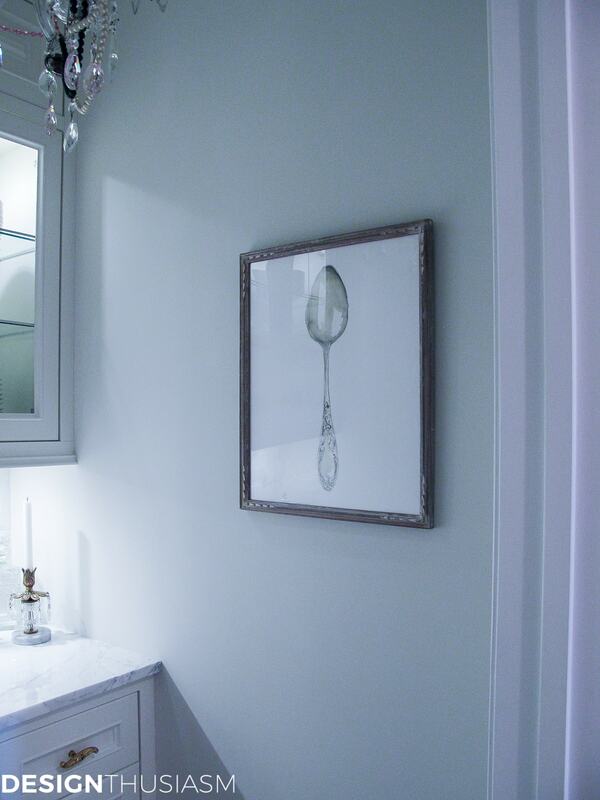 Lory, this butler’s pantry is simply perfect. I honestly do not know what more you could have done to make it so beautiful and functional. 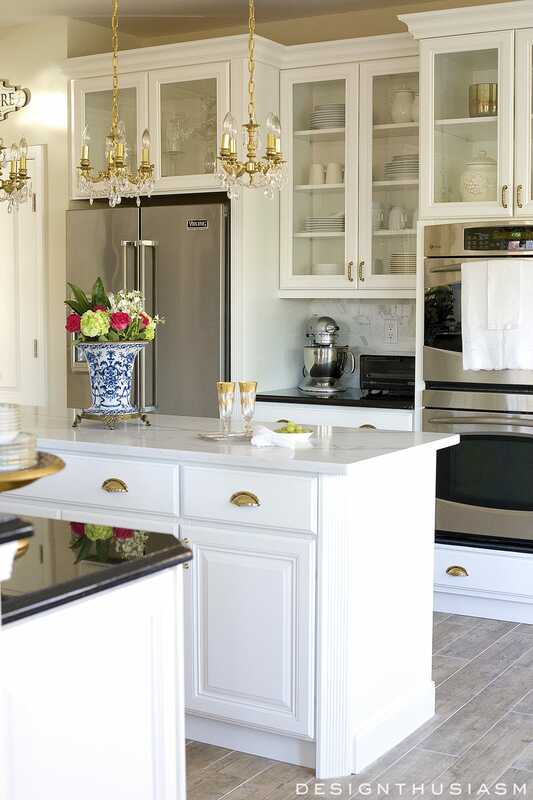 I love the gold marble backsplash and how it plays with the cabinet handles. Your embroidered linen is a quite joy. The flowers and your vintage creamer! And that ice bucket! I love collecting cocktail napkins wherever I go to use at parties. These here were perfect for the room. Oh, and I really liked the molding you added by the entrance. Just perfect.